Martin Safo is the No. 1 inventor at the top-ranked department at VCU for invention disclosures. 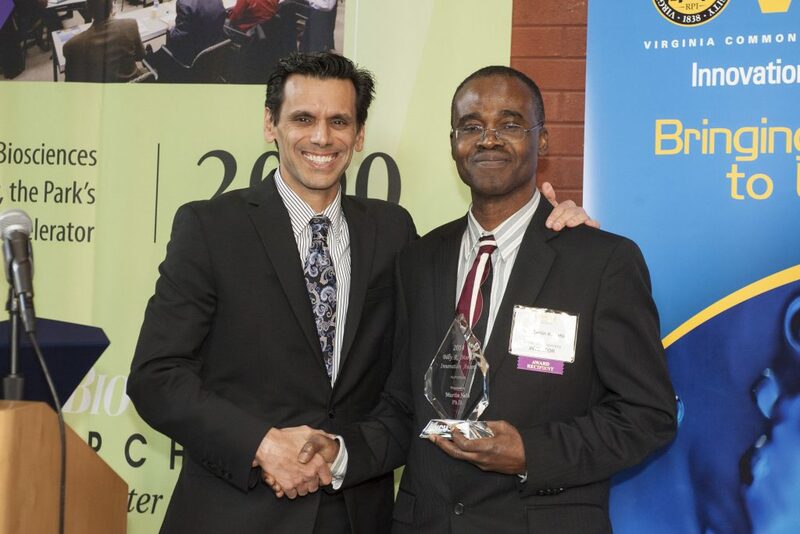 In this file photo he poses with VCU President Michael Rao, left, at the 2014 VCU invention awards. The No. 1 department at VCU for invention disclosures in 2018 was the School of Pharmacy’s Department of Medicinal Chemistry, according to the latest annual report from VCU’s Innovation Gateway. With 12 faculty members, the Medicinal Chemistry Department reported 14 inventions last year. That figure comprised more than 10% of the university’s overall 134 invention disclosures for 2018. With five inventions credited, professor Martin Safo, Ph.D., was the department’s No. 1 for disclosures. His research has focused on finding ways to improve the health of people with sickle-cell disease and those who have difficulty absorbing vitamin B6 because of a hereditary disorder that can cause severe disabilities in children. Also highlighted in the annual report is Shijun Zhang, Ph.D., an associate professor in medicinal chemistry, for his work designing a compound that can reduce inflammation in nerve tissues, a key symptom and risk factor of Alzheimer’s and other neurodegenerative disorders. Four VCU departments ranked second for invention disclosures with 12 each in 2018: chemistry, electrical/computer engineering, computer engineering, chemical/life science engineering and mechanical/nuclear engineering. When tallied by school or college, VCU School of Medicine reported the most invention disclosures with 53, followed by the VCU College of Engineering with 43, the College of Humanities & Sciences with 24, and the School of Pharmacy with 15.